Sodium ferrocyanide decahydrate or Tetrasodium hexacyanoferrate is in stock. We are successfully exporting our sodium ferrocyanide world-wide. Sodiumferrocyanide is a fine, (light) yellow crystalline.The compound has widespread use as an anti caking agent in salt, citric acid production and in pigments (Prussian blue). The substance does not fulfil the criteria for any of the hazard classes or categories set out in Annex 1 to CLP Regulation (EC) No 1272/2008 (nor is assessed to be a PBT or vPvB substance). Hence, according to article 14(4) of the REACH regulation, exposure assessment is not required. Gentrochema BV has a full registration since 2013. We can supply our sodium ferrocyanide from stock in the Netherlands. Minimum order quantity is 25 kg. 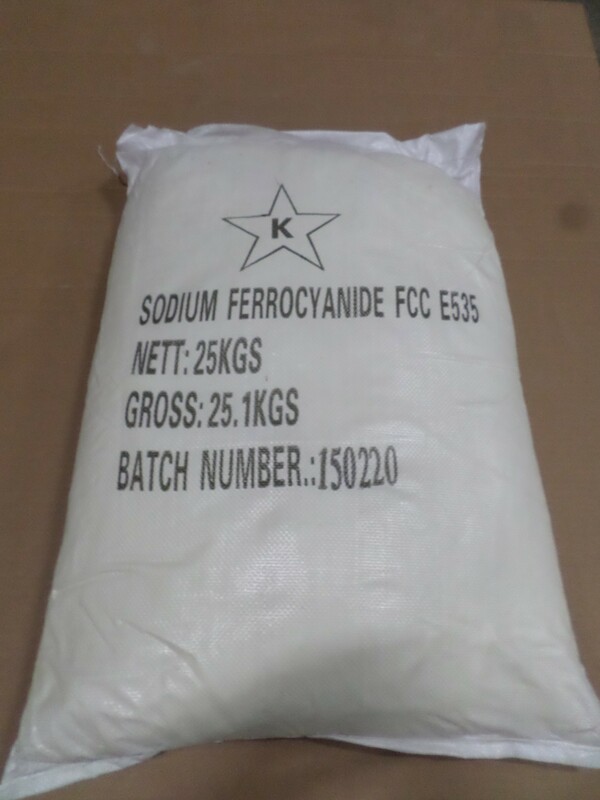 Our sodium ferrocyanide is standard available in 25 kg woven bags or 25 kg polyethylene bags. Other packing is available on request. We can also supply a sodium ferrocyanide solution. In general the delivery will take 2-3 working days, but this depends on your order. Of course, we are able to offer free delivery to all destinations world-wide. Buy sodium ferrocyanide at Gentrochema chemical wholesale. Gentrochema is specialized in the trading of niche chemical products on a global scale. In order to buy chemicals you must be 18 years of age or older and registrated as a legal company. Gentrochema will NOT sell any chemical products to private persons.